We’ve all been to the gas station hundreds of times to fill up our tanks. You get out of the car, open the tank, swipe your card and start fueling. It’s so routine that you might even miss the best (and surprising) parts about gas stations that could make your life so much easier! From tips to save you time and money to hacks that make your taste buds happier, we’re sharing the must-know gas station hacks to maximize your fill-ups. We get it – you’re in a rush and don’t have time to make coffee at home. But getting a $5 coffee at a coffee shop every day adds up. Gas stations have been rapidly ramping up their coffee offerings to offer affordable, delicious-tasting coffee and espresso drinks for a fraction of what you’d pay at a big coffee shop. 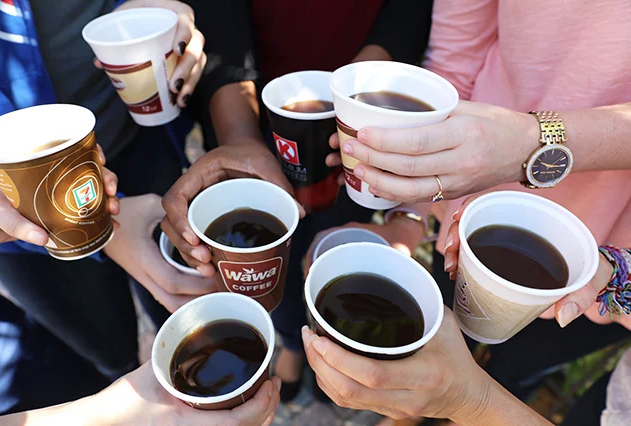 From Dark Brazilian brew at Maverik to Kenyan roasts at Wawa for $1, gas stations are sourcing fresh coffee beans and brewing it for a great price. What if you like a cappuccino or a latte instead? No problem. Gas stations are stepping up their espresso offerings too. According to our recent study, nearly 10 percent of consumers fill their cars with premium gasoline. Unless your owners manual requires your vehicle to use premium gasoline, it doesn’t actually make a difference whether you use regular, midgrade or premium. So why waste the extra money? Before checking out a new restaurant you probably look at online ratings and reviews to see what other people are saying about the food and the service. So why would you walk into a gas station convenience store without doing the same thing?? 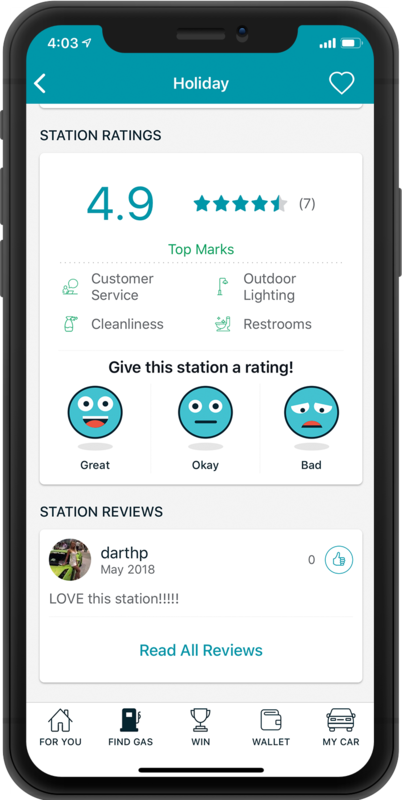 Gas stations across the USA have millions of ratings and reviews in the GasBuddy app that can tell you what people love (and don’t love) about gas station amenities like the pumps, restrooms, food and customer service. Gas stations can get a bad rep for having a plethora of foods like chips, soda and candies. But did you know that gas stations have been introducing healthy products into their stores? Many gas station convenience stores now carry salads, yogurts, fruit and vegetable trays, hard-boiled eggs, and freshly packaged sandwiches. Our convenience store analyst Frank Beard ate at gas stations for 30 days and actually lost weight by making healthy food choices. According to a study by Kimberly-Clark Corp, gas pumps are the filthiest surface that Americans encounter on the way to work. Hygienists swabbed hundreds of surfaces around U.S. cities to see what everyday objects are breeding grounds for the worst bacteria and viruses. Gas pumps are dirtiest, followed by handles on public mailboxes, escalator rails and ATM buttons. So get ready to wash your hands, spritz some hand sanitizer or even head to a full service station for your fill up. Victoria Beckham has the right idea. It’s true that gas station convenience stores have everything you could need (with a slightly higher price tag). But that doesn’t mean you need to pay for the convenience! There are loads of loyalty programs that will give you discounts and rewards for purchasing fuel and snacks, including Pay with GasBuddy, the only free payments program that gives you 5c off per gallon at nearly all of the gas stations in the United States. Besides offering fuel and snacks, gas station convenience stores have plenty of amenities for you to take advantage of. Worried about package theft? More than 2800 locations, including convenience stores, have Amazon lockers where you can securely pick up your deliveries. Need cash fast? One third of America’s ATMS are in convenience stores. Lastly, if you’re feeling hungry, brands like Wawa, Sheetz, Casey’s and more have developed massive fan followings for their fresh, hot foods and many stations in your area are following suit. Do you have any gas station hacks that we could add to this list? Let us know in the comments!